Speaker sound can be improved immeasurably with customisable plinths. DR RICHARD VAREY explains. Small loudspeakers are designed for stand or shelf mounting. 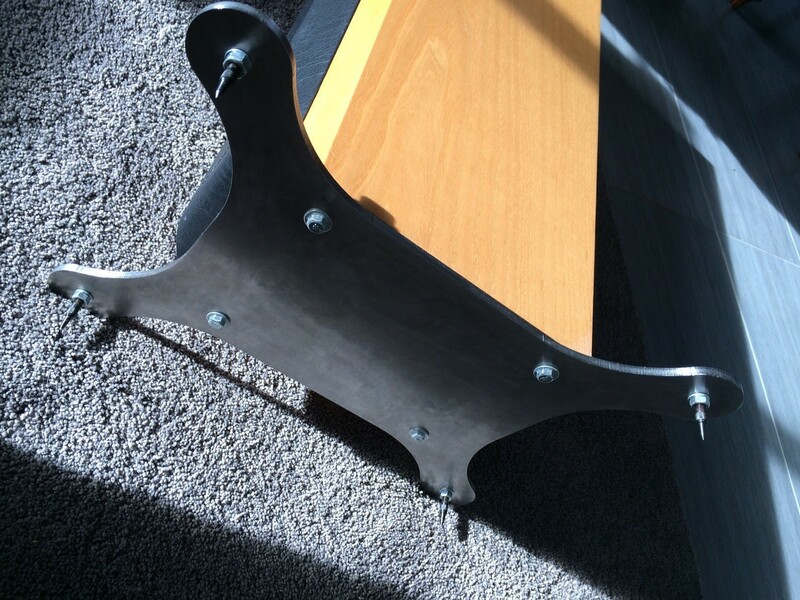 Most floorstanding speakers come with spikes to raise them from and couple them to the floor. 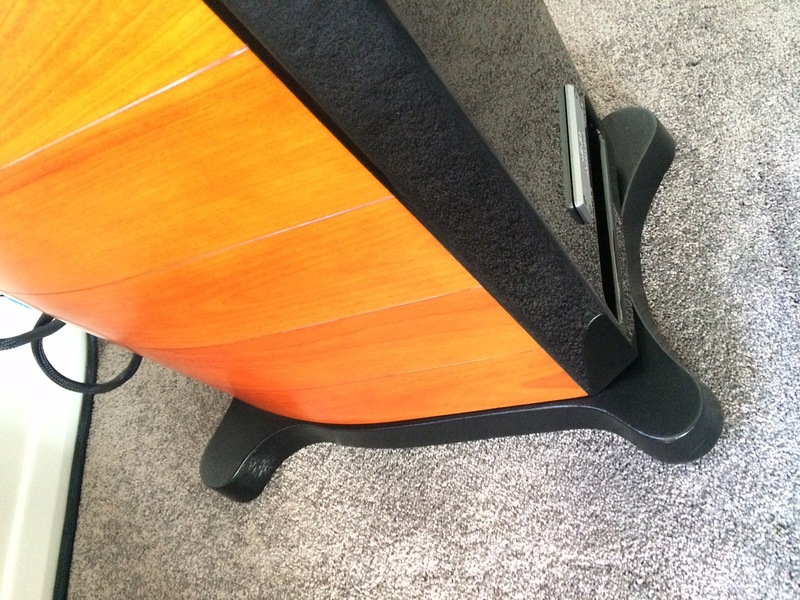 This ‘micro-stand’ approach is generally sonically beneficial in lifting the cabinet from the floor and further stabilising tall tower speakers. The added mass and bigger footprint improves stability with both sonic and aesthetic improvement. My hi-fi friend Mike Pearson showed me the DIY plinths he made after seeing branded products that were far too costly. 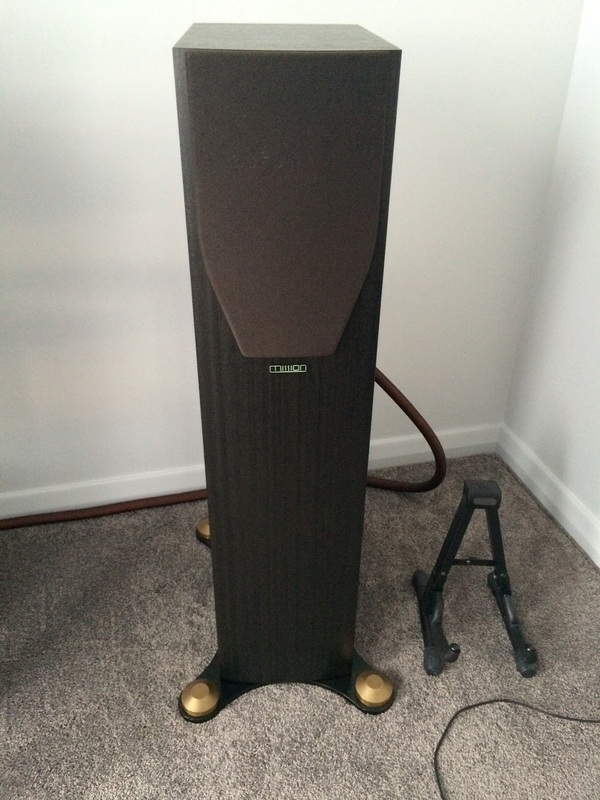 He shared his approach with me and supplied me with a pair for my own Audio Pro Avanti 100DC floorstanders. With large speakers designed for floorstanding, I hadn’t expected that raising them off the floor would enhance performance, yet the notion of adding mass at the base seemed to make sense to my physicist mind. Raising the speakers from the floor by 6.5cm instantly resulted in a more solid soundstage and deeper, tighter bass – thus also lifting the performance! The Audio Pro speakers are quite large (27.6 x 43.0 x 110.5cm and weighing 29kg) and were supplied with small spikes (just 6 x 25mm) which I chose not to use. For several months they stood directly on our floating wooden laminate floor over concrete, and sounded very good. I was satisfied, yet fixing them to the plinths was quite revelatory. I’m right now listening to an album that has come even more alive. I wonder if the designers tried plinths and compromised because they are tricky to include in the box or hard to sell as an add-on without audition. I have no doubt that a proper audition proves the point vividly. 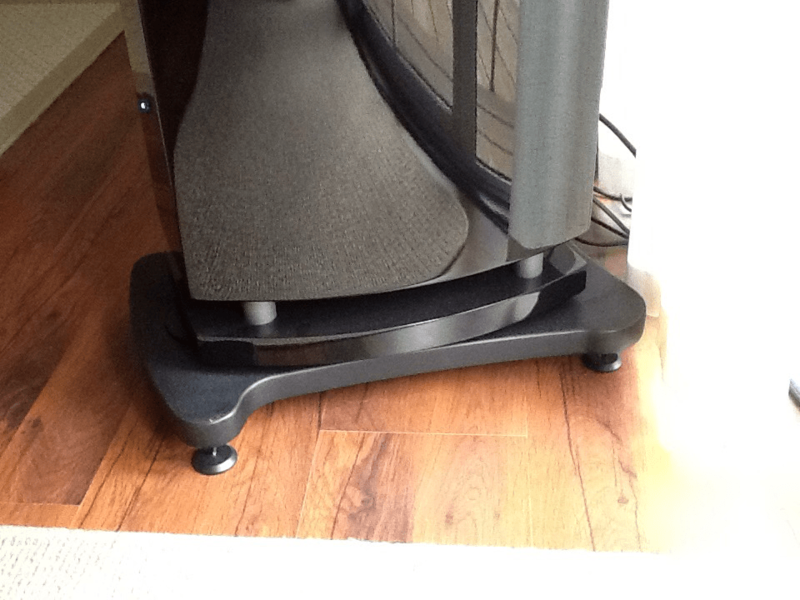 Floorstanders need to be mounted on heavy plinths to sound fully alive and responsive. Mike has treated several speakers with this addition, achieving greater depth of bass and speed of response in each case. To his Mission M773 he fitted 6mm stainless steel grade 304 with an approximate weight of 5.3kg, finished by polishing the stainless plate only. These plinths were profile cut using a CAD drawing on a water jet machine. They were then marked out for the original speaker spike-screwed sockets and drilled 8.5mm clearance. The four holes in the outrigger sections were drilled and tapped M8, to accommodate the spikes. The plinths were bolted to the speaker base using M8 bolts. Spikes were fitted and are retained by a lock nut on the underside and a stainless dome nut with a stainless washer on the top side. The Mission M773s originally came with a rather pathetic looking plastic rear outrigger, to give the speaker more stability, and they looked like an afterthought to fix a stability issue. The stainless steel plinth provides more stability by adding a localised bottom mass and wider footprint. Mike feels that the plinths have added greater and more extended bass response and a quicker delivery than the original OEM set-up. On a pair of Mission M73i’s he fitted 8mm carbon (mild) steel plinths with an approximate weight of 8kg. These were finished by profile sanding, priming, satin black spray painting, then clear coated. Eight coats in total were applied. These plinths were profile cut using a CAD drawing on a plasma machine. They were then marked out for the original speaker spike screw sockets and drilled 8.5mm clearance. The four holes in the outrigger sections were drilled and tapped M8, to accommodate the spikes. The plinths are bolted to the speaker base using M8 bolts. Spikes were fitted and retained by a locking jam nut (half the width of a standard nut) on the underside and a fitted with custom machined and tapped brass dome covers on the top side. The M73i speakers have a cavity in the bottom of the speaker where you can add sand or lead ballast (as recommended by Mission) and this was an earlier modification that Mike had already made, so probable total added mass would be 15kg per speaker. On both sets of Missions, he used a rubber gasket of approximately 1mm thickness. In discussions, some fellow enthusiasts suggested removing the gasket to get a better coupling between the speaker and the plinth, which he tried, but to Mike the speakers sound better with the gasket fitted. His Usher Mini Dancer II DMD Series speakers came fitted with OEM plinths that were a composite of high density MDF with a mild steel plate set in and glued to the MDF to add weight to the plinth. Usher opted to update those plinths after the release of the speakers, so Mike upgraded to the 41mm thick ribbed cast iron plinths which also have conical spike covers that blend into the plinth. The cast iron plinths certainly add weight and more stability to the speakers, but when Mike first received them, he was not happy with the paint coating, so he had them grit blasted and found that there was quite an amount of porosity in the casting. Consequently, he faired them with a plastic epoxy putty and then sanded them to a more cosmetically pleasing profile and finish. They were then primed and painted in a satin black, and clear coated upon completion. There are now eight coats on them and the finish is similar to the piano black on the front panel of the speaker. The Usher plinths were provided with a rubber gasket, so this was used along with all of the supplied mounting bolts and spikes. From his experience with these projects, Mike now believes that any floor standing speaker is typically top heavy if the drivers are mounted at the top of the cabinet, so a plinth adds stability and helps to better couple the speaker to the floor. There are gains to be had of extended bass response and seemingly quicker delivery, although these terms are subjective and hotly debated by many hi-fi enthusiasts, as is the choice of materials: hardwoods, granite, stone, or metal spikes?